Ok, to start things off, this is a DIY specific to the RB series of motors, BUT can be adapted for just about any motor. There will just be a little less to deal with on most motors. 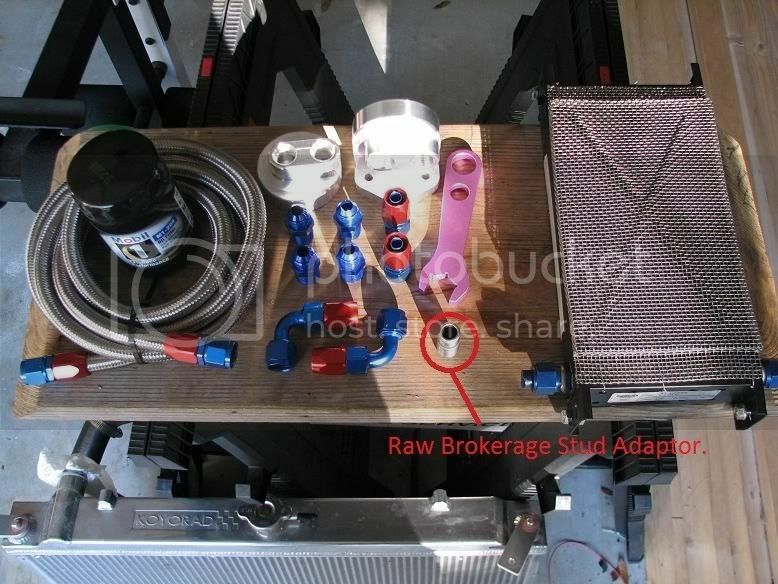 I am not going to go into details on how to cut stainless braided line and how to assemble hose ends, but this is a good write up for that if you need help. Now on to the fun. This will be very similar for all series of RB motors. The parts used/needed are subject to what you decide to use but I will include all the parts that I used as well as the optional parts I swapped in to make life easier in the future. 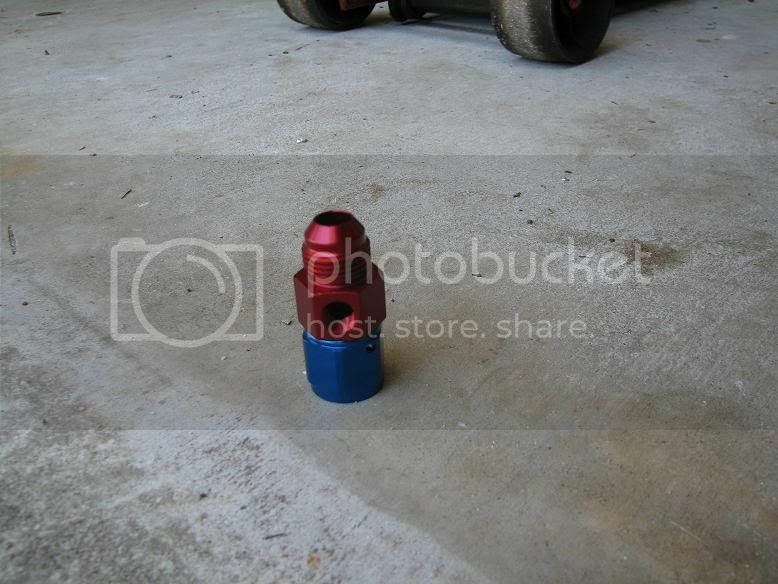 -Four -8 AN hose ends (I used -8 but you can use whatever size you like. I would NOT use anything smaller than -8 though. You will also need to determine if you need straight or elbow hose ends. This will depend on the cooler you are using and your personal setup. OK, so let’s get started. 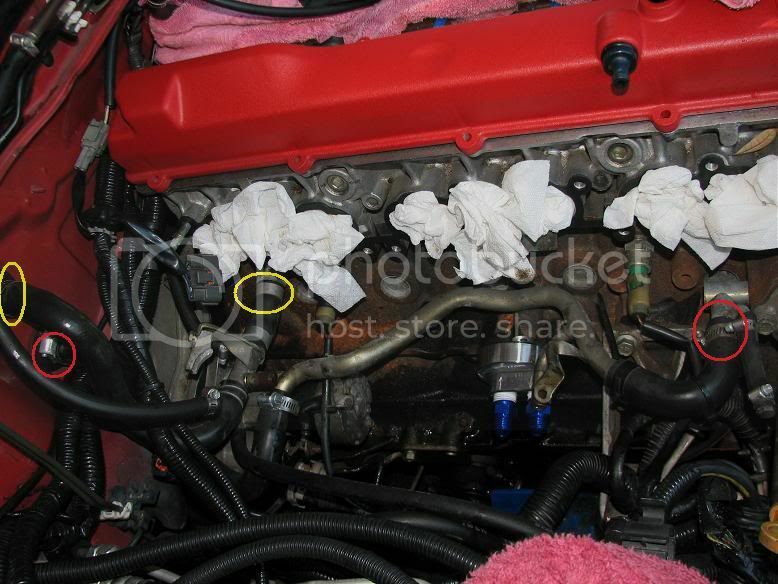 At the time I did this upgrade I had my intake manifold off so it made everything 100% easier. You can get this done from under the car, but if you have an aftermarket manifold then it’s not that hard to remove for this project. First things first. 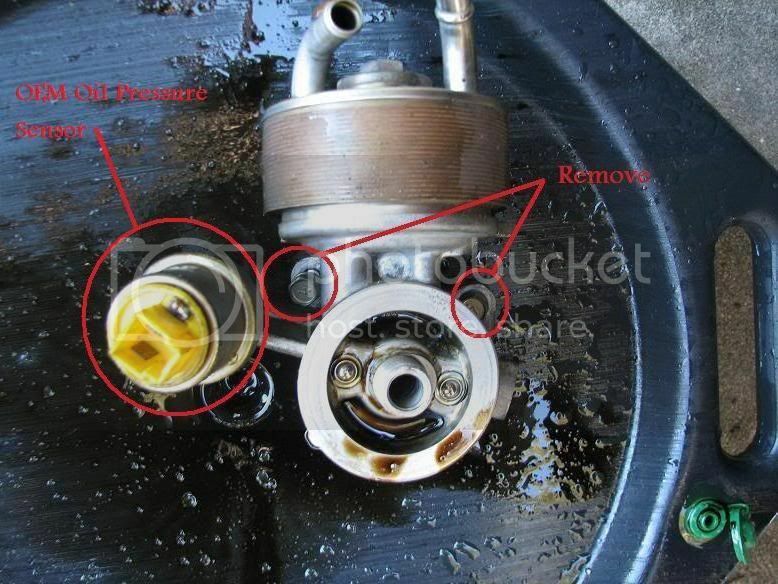 Drain your oil and remove the filter. Also drain your radiator or have a lot of rags ready as you will be removing the factory oil cooler which uses a loop into the coolant lines for cooling. If you take a look at everything before It’s torn apart you will see this! Start by removing the line at the two spots I have circled in red. This will give you more room to work. Next remove the 2 hoses from the oil cooler. Then you can unbolt the oil cooler. 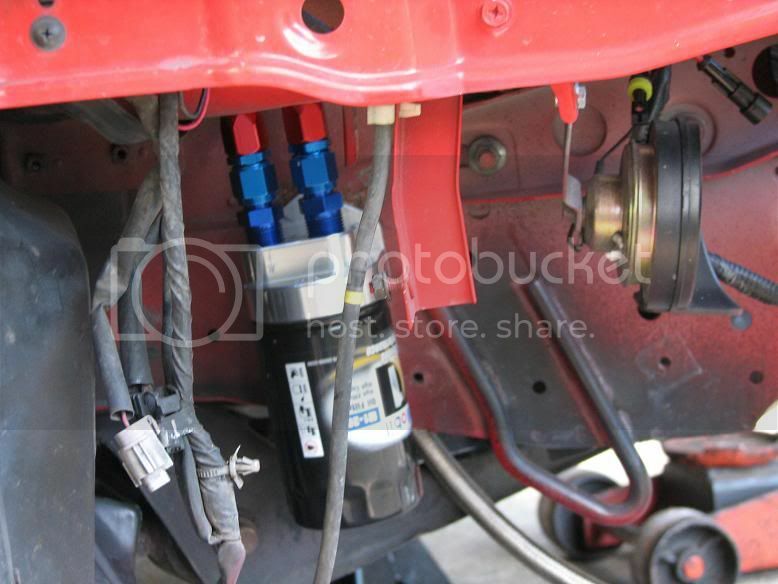 There are 4 bolts holding it to the block as pictured below. 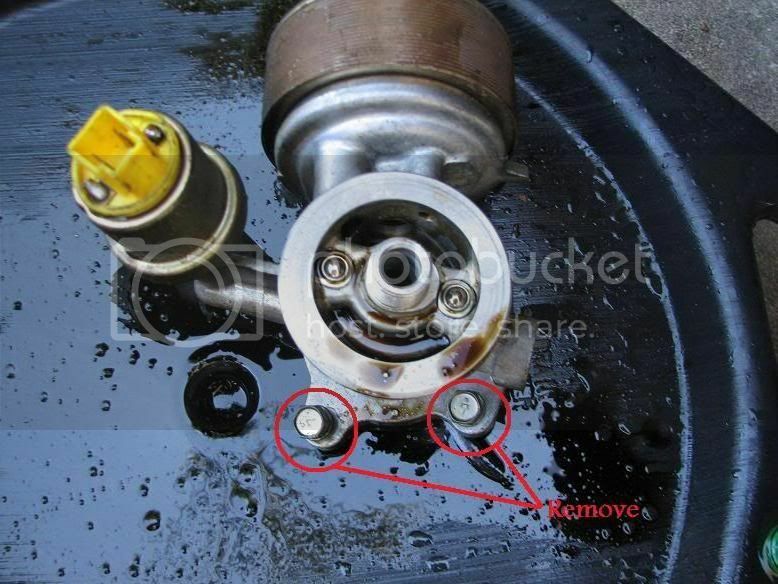 Be careful not to damage the oil pressure sensor. 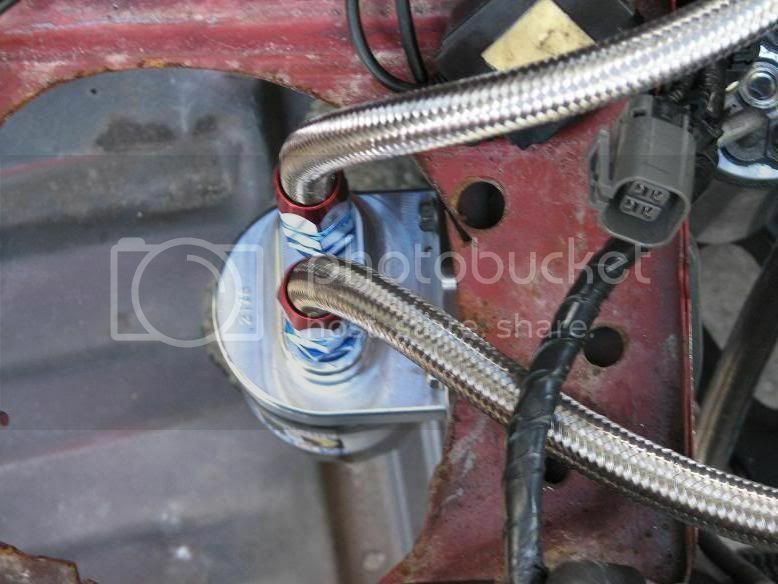 Once you have the cooler off you can remove the oil pressure sensor and set it aside for now. Next you will need to remove the factory oil stud. You can do this with a wide flat-head screwdriver, or a small screwdriver laid sideways into the end grove. It will just unscrew counter clockwise and should not be in there very tight. Next screw the replacement stud you got from Raw Brokerage into the block. Now we can move onto the thermostat and adapters. Go ahead and grab the 4 1/2″npt to 8an adapter fittings, oil bypass adapter, the filter relocation block and the thermostat. Put some teflon tape on the npt threads of the adapters and go ahead and screw them into the bypass adapter and the filter relocation block. They are tapered threads so they will not screw down all the way. Tighten them good and tight but DO NOT crank down on them. They are aluminum and you can damage or break them if you try to go too tight. Next take the two -10AN ORB (o-ring) fittings and screw them into the ports on the thermostat sandwich. These are straight thread and will bottom out and seal with the o-ring so just tighten those until they stop. Next, take the thermostat and screw it onto the block. Should screw right onto the replacement stud you put in place. I like to put a drop of oil on the o-rings of the adapters as well to help seal and keep them from binding while turning. After that screw the adapter onto the thermostat. I did not have the thermostat at the time of taking pics so it is not pictured but the setup is pretty straight forward and should go as follows: block > thermostat > bypass. Once you have everything where you want it and mounted you can measure your lines, cut them and attach the hose ends. I put the filter between the cooler and the block. so the flow of oil runs from block>oil cooler>filter>block. There are arrows on both the bypass and relocation adapters to let you know which line goes where. 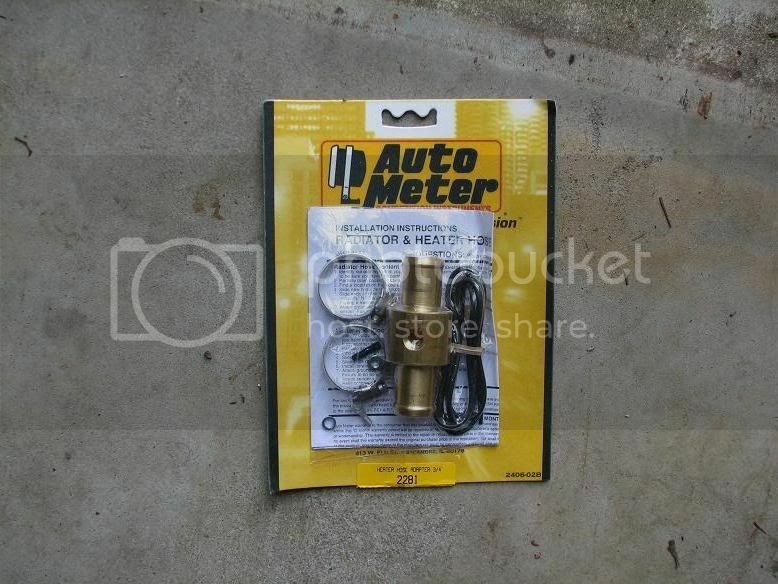 Next take the factory oil pressure sensor you set aside and put a little teflon tape onto the threads. Screw it into the gauge adapter and then attach it to the oil bypass adapter. 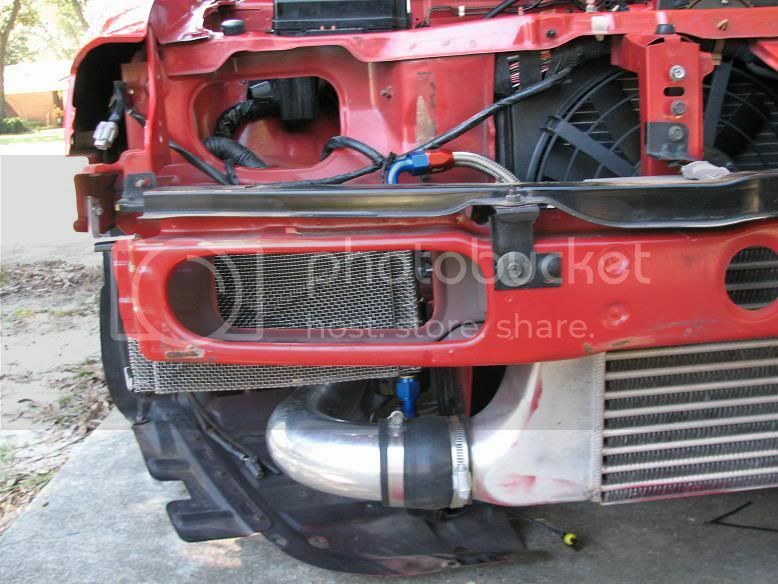 It can honestly go on either port but seemed to fit better with the manifold on the front port. After that is in place hook up your lines. Now comes the optional part. I decided to clean everything up and remove all the factory hard lines and old hoses and replace them all with new heater hose. 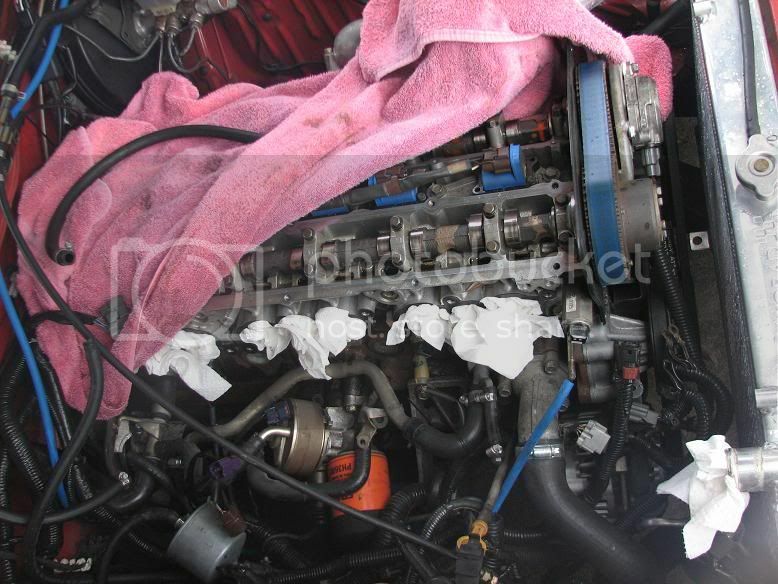 The heater lines are 3/4″ If you look at this picture you can see the two main hoses. I circled the ends in matching colors so you know where they go. 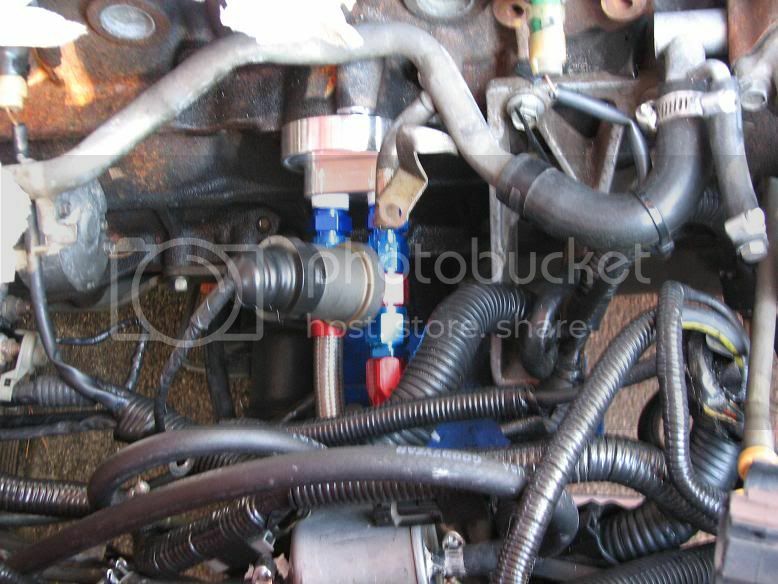 Alternatively you can get hose caps for the oil cooler hard lines and just cap them. Now if you look at this next picture I circled in green a big nasty 4 way adapter. 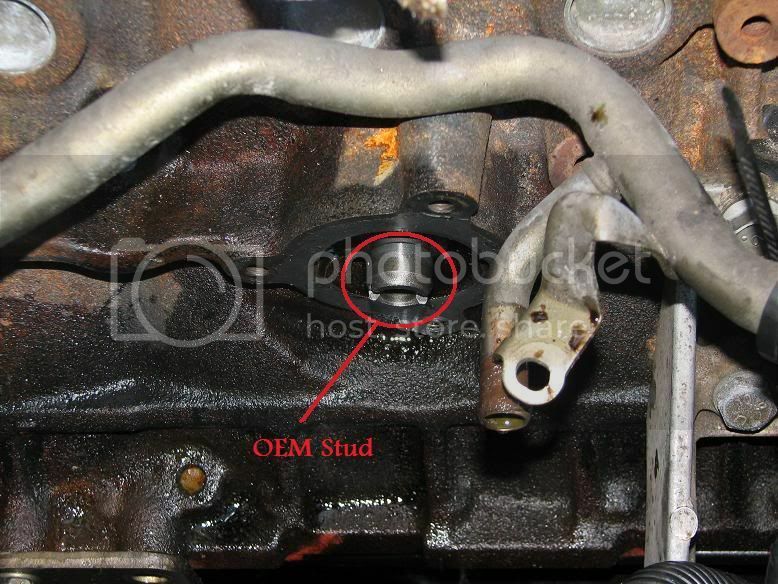 Originally it brought water from the block and distributed it to the heater core, the oem oil cooler and this was also the water feed for the turbo. Since the factory oil cooler is gone one less port is needed. Again you can just cap it if you wish, but i decided to make it easier for running SS lines for the turbo. Take the 1/8″npt adapter you chose to use (either to convert it to AN or barb) and put some teflon tape on the threads. Go ahead and screw it into the autometer heater hose adapter. Again, these are npt threads so tight…but not gorilla’d! 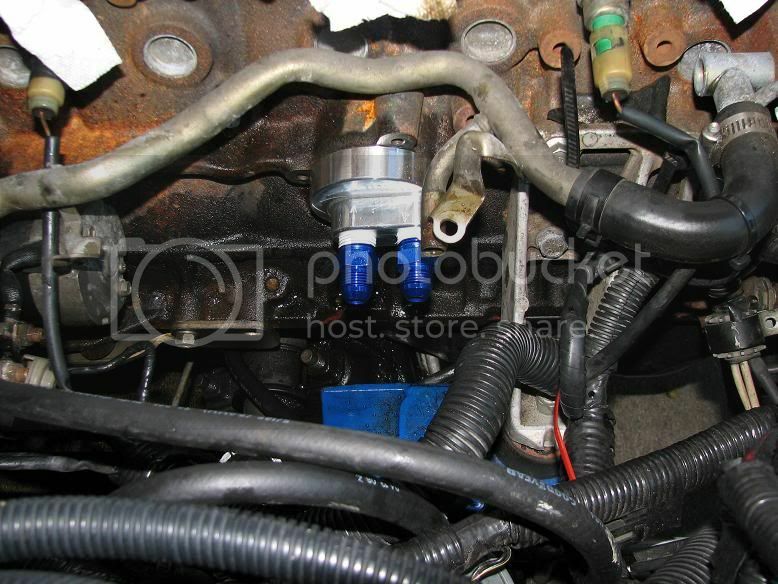 Next just insert the heater hose adapter into the area of the green circle, replacing that factory 4 way piece. now…if you are still using factory rubber line for turbo water feed just push it onto the barb fitting and clamp it. you can always change this fitting out later for a AN fitting as well! Go ahead and hook up the other heater hose line and that’s it. Fill the radiator back up, put in your oil and check for leaks. Let the motor run for about 10 minutes or so until the thermostat opens and monitor for leaks. If you have a leak on an NPT joint just give those fittings a 1/4 turn at a time till the leak stops. after the thermostat opens let it idle for another minute then shut it off and let if sit for a few minutes so the oil can settle back down. Now when you fill your oil make sure to keep in mind that you will have extra oil capacity due to the lines and cooler holding oil and you need to put more oil in than normal. My setup took right at 6 quarts total. Hope this helps someone, and as always…if you have any questions feel free to PM me!